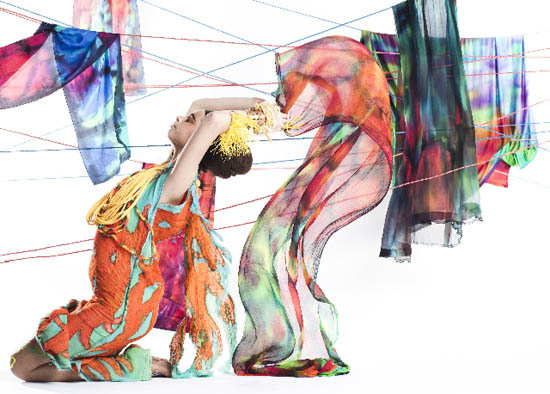 Linda Jackson Develops Tropical Images for Australian Fashion Designs. 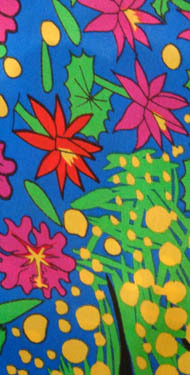 Fashion Icon, Linda Jackson, Develops Tropical Images for her Designs. 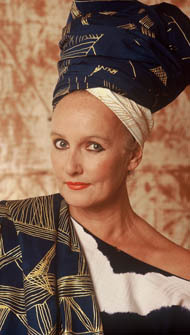 I first studied the work of Australian fashion icon, Linda Jackson, at Edith Cowan University in Western Australia, some decades ago. 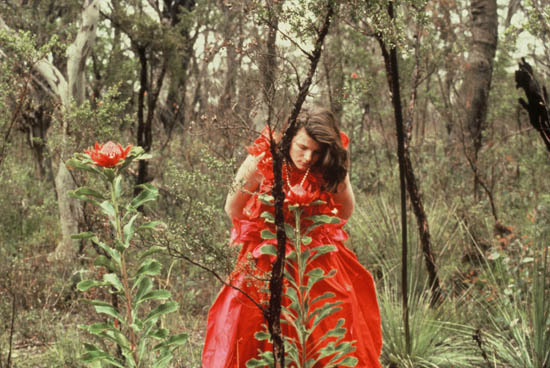 The beautiful images of her Bush Couture range were larger than life on the huge screen in the auditorium and we gasped in admiration as the essence of Australian bush and culture floated before our eyes. 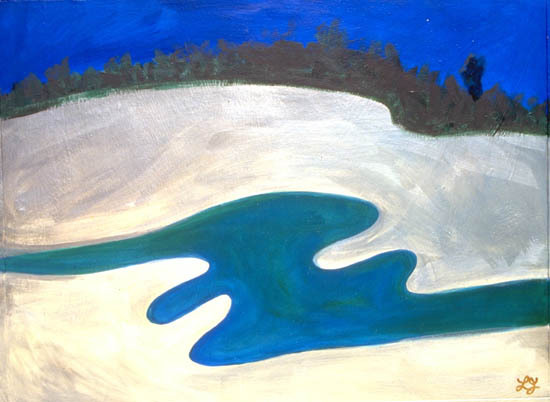 For Linda had managed to brilliantly capture the colour, line and form of the landscape of the Australian deserts, of forests, of snow covered scribbly gums, of Sturt's Desert Pea and of the flamboyant waratah and age-old banksia, which are so iconically Australian. The results were stunning and formed the basis of the Linda Jackson Collection at the Powerhouse Museum in Sydney. 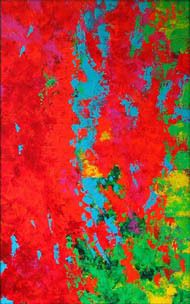 Such spontaneity and apparent ease with which art-forms evolve is, in my opinion, the premise of a true artist. Linda often photographs her own work, this one on the left, which captures the reflection of appliqued Australian wildflowers, being amongst her favourites - and mine! 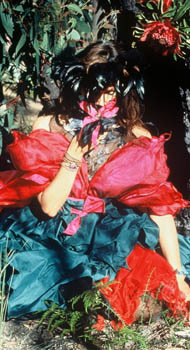 Along with fellow artist, Jenny Kee, Linda was to create a unique and flamboyant Australian fashion - art to be worn. The pair collaborated further by staging fashion extravaganzas every year as Flamingo Follies Parades, named after Jenny's shop in the Strand Arcade. In 1982 Linda moved to her spacious new studio, Bush Couture, in Kings Cross, where she continued to hold salon showings and exhibitions. 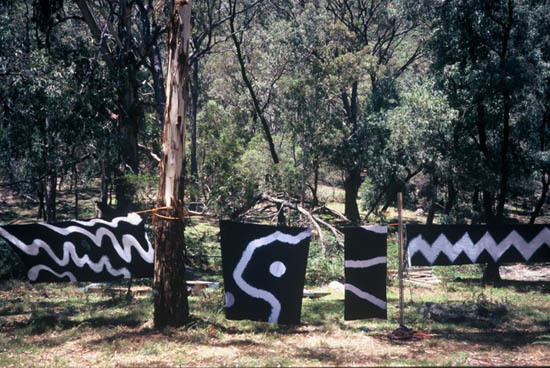 Apart from designs inspired by forays into Africa and artists such as Sonia Delauney, images of the Australian bush and the 'red centre' consistently informed her textile and fashion designs. 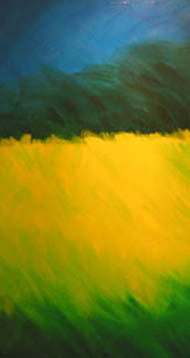 She remarked in 1985, "Australia is an artist's paradise. For me it's an endless source of ideas and influence". 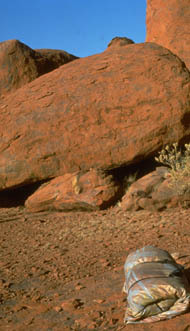 Before coming to North Queensland Linda worked in several Australian desert communities, where aboriginal women were both her students and teachers. 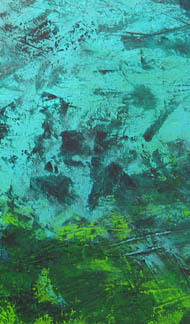 Utopia, in particular, was the source of a number of collaborative batiks reflecting the watercourses, hills and stony desert of this often harsh land. But, oh! What magic erupted in those years when rain fell and the desert bloomed! Linda's fabulous Sturt's Desert Pea dresses reflect the drama of carpets of these black-eyed brilliant red bunches of erect pea-shaped flowers rising from a bed of soft green leaves. Some ten or so years ago I was delighted to meet Linda in person when she came to live in the Douglas Shire in North Queensland. Dreadlocks held back by a self-printed bandana, sculpted off-the-shoulder costume and bare feet, she was charming and friendly, modest and self contained, aware of her own worth, grounded but poised to fly. And fly she has. 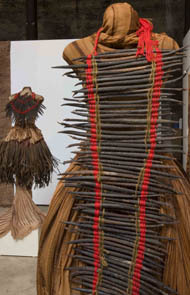 Always interested in indigenous cultures, Linda gains inspiration from the Kuku Yalanji people of Far North Queensland, with whom she works, and from her surroundings. 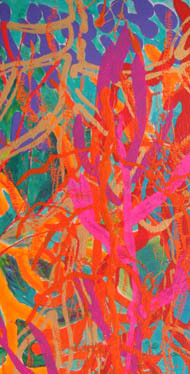 The result is exploratory semi-abstract tropical paintings and fabrics, some of which were displayed alongside selected costumes at Cairns Regional Gallery during 'Essence', a retrospective of her work in 2006. 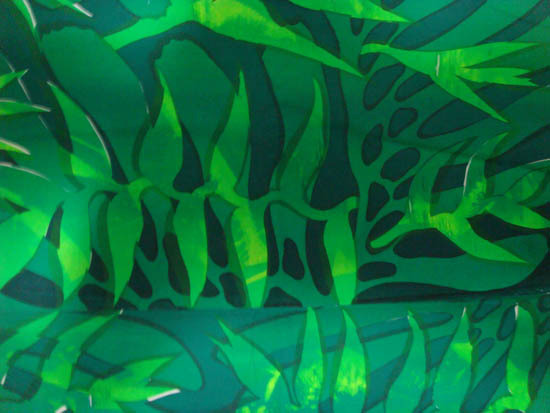 'Heliconia', a green version of the original hand-printed furnishing fabric commissioned by Club Tropical boutique resort in Port Douglas, North Queensland. 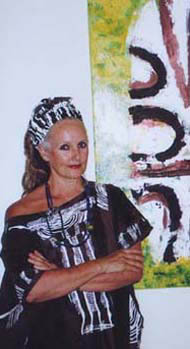 Recently I was privileged to browse through some of the archived images of Linda's work, developed during her career. 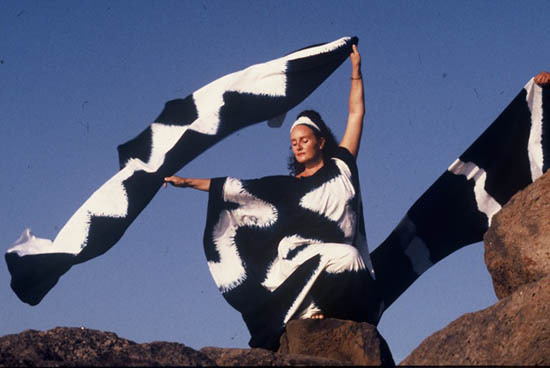 What an exciting journey that was as I discovered design triggers, found in Nature, and how these ideas had been translated into the most glorious of fabric and fashion, unmistakably Australian. 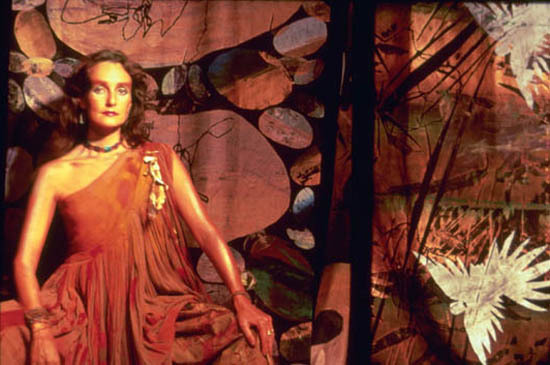 Many of the fashion pieces were then photographed, often by Linda herself, in the setting which inspired them - brilliant! 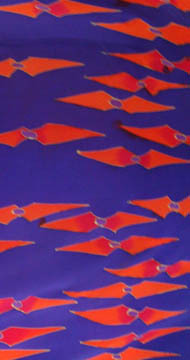 Series of 'Opal' scarves - isn't this a great photo? 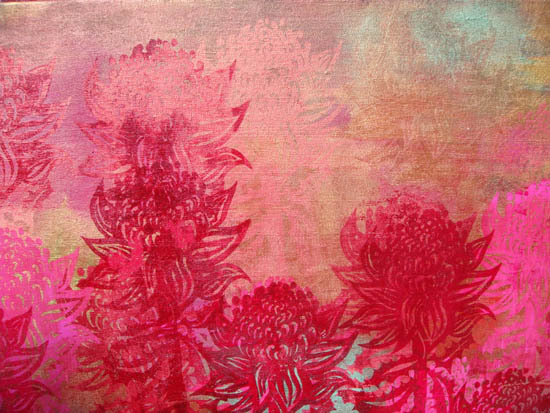 Since coming to live in Far North Queensland, Linda has been teaching and working with textiles but has also been developing tropical paintings, which explore the world of reef and rainforest that surrounds her. Living as she does on a tidal beach with the Great Barrier Reef and Daintree Rainforest on her front doorstep and a mangrove creek behind, it is hardly surprising that Nature is her inspiration. 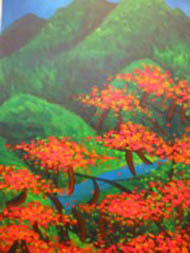 'Rainforest Colours' - one in a series of tropical paintings. Photo Linda Jackson. Linda's research is very much a 'hands-on' affair. 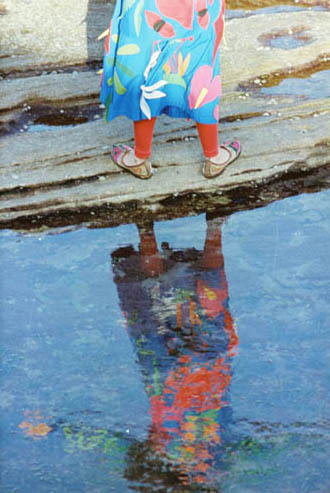 Snorkelling at Low Isles, clad in a 'stinger suit' with added colourful top of her own creation, she looks like a glamorous reef fish herself. 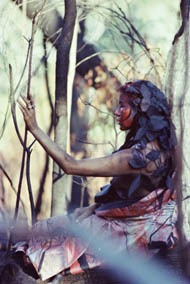 Squelching through sticky mangrove mud in search of the roots of red mangroves with which to laboriously dye a length of silk or organic cotton, she soon takes on the brown, muddy camouflage of that environment. 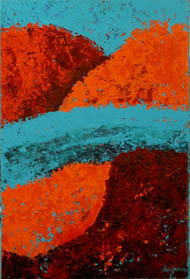 'Broome River', acrylic paint on canvas, resulted from one of Linda's trips to the Kimberleys in Western Australia. The vivid splash of carmine bougainvillea seen against a background of dark, brooding jungle or the nodding purple heads of sugar cane in flower as far as the eye can see, are all absorbed and waiting to find new life as a painting or fabulous silk designer scarf. 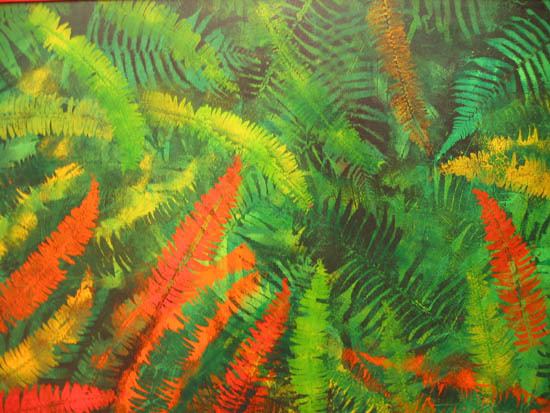 Layers of tropical leaves are stencilled onto canvas or fabric, building up a depth that invokes the feeling of diving into a sea of foliage - Linda's garden. Leaf stencils are almost a Linda Jackson 'trademark', from the environmentally tough leaves of gum trees with their eucalyptus fragrance to the softer, huge leaves of the Australian rainforest - monstereo delicosa and towering fan palms. 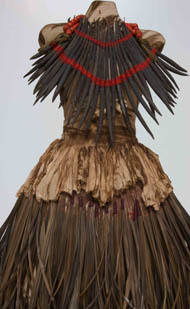 Using the roots and leaves of red mangroves that grow in the tidal creek near her home in North Queensland, Linda develops a natural dye bath in which she steeps cotton or silk fabrics for various lengths of time. 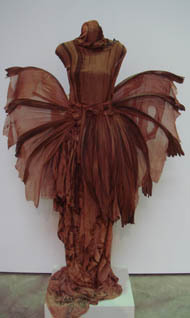 Dyed heavy cottons, gossamer silks or actual mangrove seedlings, complete with roots, which have been found washed up on the beach across from her studio, form the basis for draped layers of fabric with found objects adorning them - and a new fashion creation is born! Hand stitching her pre-washed organic cotton or silk length of fabric in simple patterns, then pulling the stitches tightly to form a resist to the indigo dye is the first step in the rather long process of shibori dyeing for Linda Jackson. The indigo dye bath is then prepared and benches protected - or the dye bath is placed in the garden. Indigo dyeing can't be hurried, in fact it is quite a meditative process as the fabric is moved gently in the bath away from the air, which would oxydize it and interrupt the dyeing process. 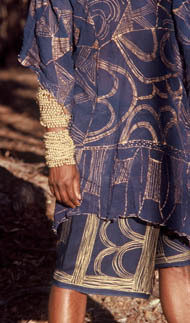 The longer the fabric is held in the dye bath the more dye is absorbed by the fabric and the darker the blue achieved. 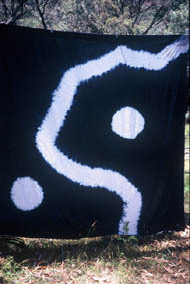 Other methods of making a resist to the dye include wrapping on poles or folding so as to produce a pattern. 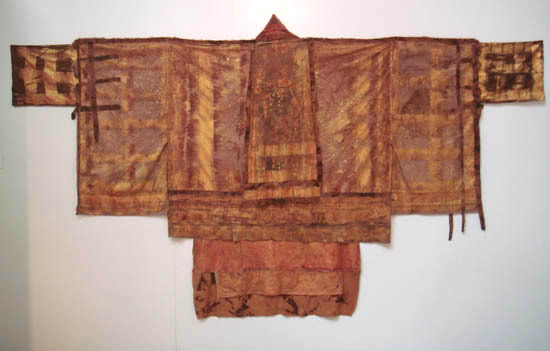 Some of Linda's mangrove dyed creations have been used for theatrical costume design.See this recent video: Linda discusses costumes for The Colony. Linda enjoys running workshops in indigo dyeing, the use of natural dyes and 'no fuss' fashion, using students' own fabric creations so, if your group wishes to enquire about classes, please contact Linda via the form, below. 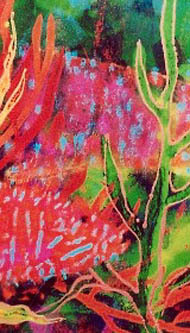 Linda Jackson original textiles and paintings.